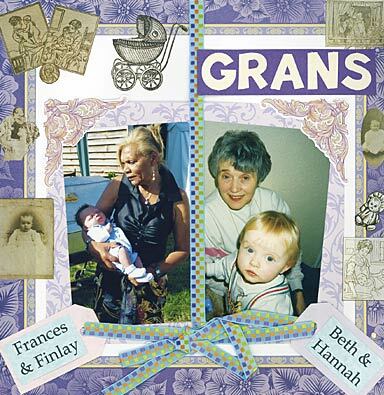 Scrapbooking for grandma is a pastime which can only create pleasure and gratitude for the grandmother in question. In fact, it is likely to give you great pleasure too. I found this background paper in a 'Clover Heritage Page Kit', and thought it had just the right blend of feminity and formality. The photo matting paper is another offering from the same page kit. I looked around for embellishments to enhance this layout and eventually found some lovely 'Royal E-Z' rub-on transfers from Royal and Langnickel Brush Manufacturing in Indiana. These gave the exact images that I was looking for - old dolls, sepia baby photos and that wonderful old pram! How did people ever get those round stores? !